Simeon Wenban was the founder of the Cortez Silver Mine in Cortez, Nevada, which at one time was the third largest silver mine in the world. Ironically, Wenban made much of his fortune from the limestone surrounding the silver. Wenban was born in the English parish of Hawkhurst in 1824, the son of a wheelwright. In 1828, his parents moved the family to Utica, New York and later to Cleveland. In 1854, Wenban moved to California to begin a career, but moved to Nevada in 1862. Before long, he was one of the richest men in the area having become a millionaire many times over. Much of his success came from finding new and innovative ways to extract the maximum amount of ore from a mine. During a difficult financial time at his mine, he found it difficult to pay his Cornish workers. They became restless and angry with Wenban. He fired them and replaced them with Chinese workers who were far more patient in waiting for their pay. Unlike many other miners in the area, Wenban befriended the Ute Indians of the area, who often brought him gifts of game and dressed skins. 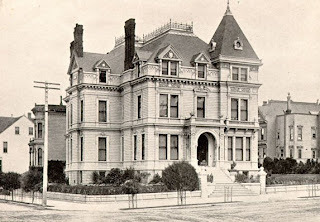 In 1888, Wenban moved his family to San Francisco and erected a magnificent home at Van Ness Avenue & Jackson Street. In 1892, out of an act of sheer generosity, he decided to build a beautiful new home for the Bohemian Club, but the officers decided that the expense in maintaining it would be to great and they never occupied the building. Hi I am Frederick Myles Wenban from Australia and am putting together a website on the Family. Simeon is from the same lineage as myself which originates Wadehurst Sussex. Was wondering if I could use some of your material? It turns out Simeon is more closely connected than I first thought. He was my Great X 3 Grandfathers 1st cousin which makes him my 1st cousin! 5 times removed as he was 5 generations back.